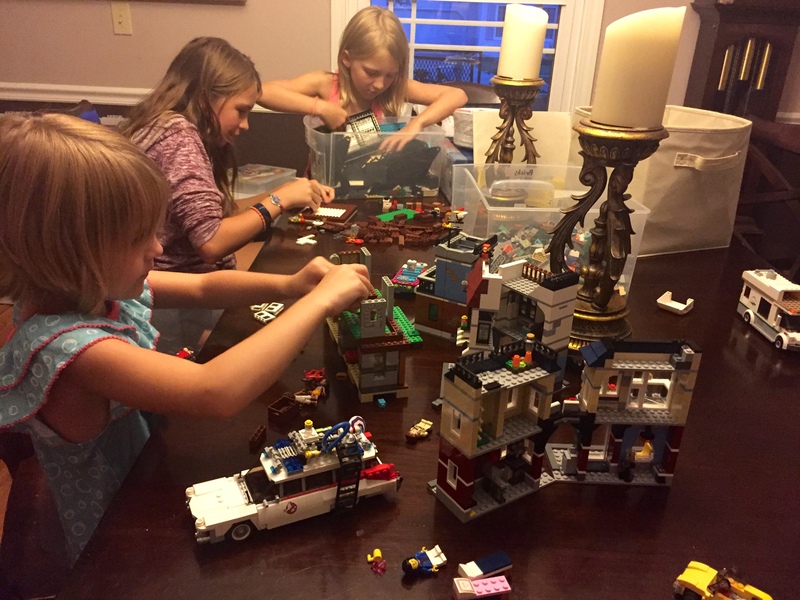 A few weeks ago, our girls got a little Lego bug and decided to bring out all the Legos and play together at the dining room table. They played happily together and got along for hours all day and into the night, I was afraid to even walk into the room and spoil the great sibling moment. Normally there are always disagreements and arguments over who lost a critical Lego needed to finish a project or big time drama if one accidentally drops a creation and all the pieces scatter all over the floor. It’s a mad dash to pick them all up before our dog George gets to them. But this time, they all were getting along, having fun and really playing well together. I had to enjoy the moment, but also couldn’t resist capturing just a little picture to mark this date in history and also for use as proof that it is possible to get along and enjoy your sisters’ company for more than 10 minutes! My nieces all get along so well. They truly appreciate and adore each other’s little quirks and personalities. I’ll add in that three out of four of them are 18 and older. They know each other so well, have so many little inside stories and jokes. I hope and pray that our girls grow up to have that same sisterhood bond as my nieces do. My nieces remind me that it wasn’t always rainbows and roses. There were periods of time where they fought, annoyed each other, and really didn’t feel the connection that they do now so I have to remind myself of this. I didn’t grow up with a sister, so I’m learning this from loving and watching my nieces grow up and being lucky enough to have three daughters. It’s a journey that they are all trudging through at different ages, levels and speeds – living together through many ups and downs, phases, fads, attitudes and hormones! Let’s not forget the hormones! So I savored this Lego fest and didn’t mind the dining room being a disaster for the day. I laughed at some of the crazy things they said and how each one builds things differently. There’s something about the little distinct clickity-clack jingling sounds of a child rummaging through a bin of Legos looking for a particular missing piece that just brings me back to my childhood. My older brother and I would play with Legos, but he was definitely the engineer and builder. He was skilled. He could build a car or a helicopter all on his own with no plans for my little hamster Sugar to ride in. He was patient with me and let me build alongside him (usually a house of some sort). No hamsters were harmed, don’t worry. Sugar went on to live a long and happy life and I think she loved the little mazes and gadgets we created for her. I made this Bruscetta this weekend while my parents were visiting. It was a hit and it’s a recipe I’ve made for years and I couldn’t believe I had never shared the recipe with you before. 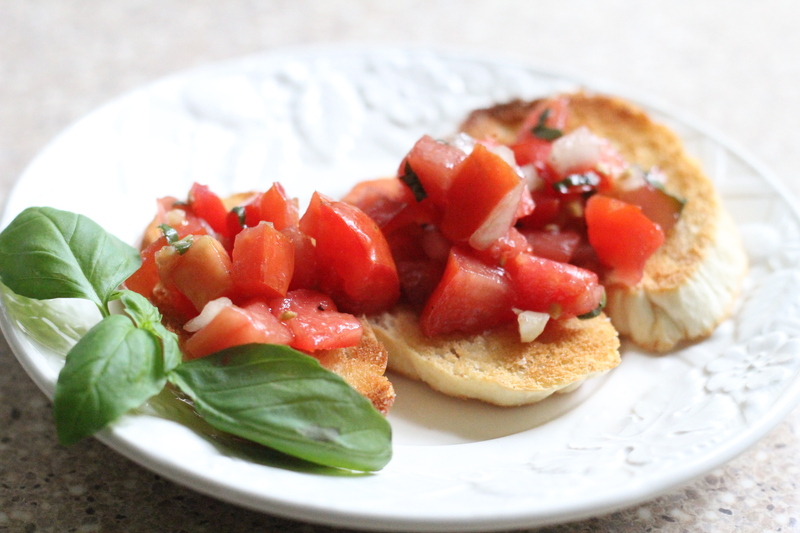 It’s a basic bruschetta and you can change up the flavors if you like. 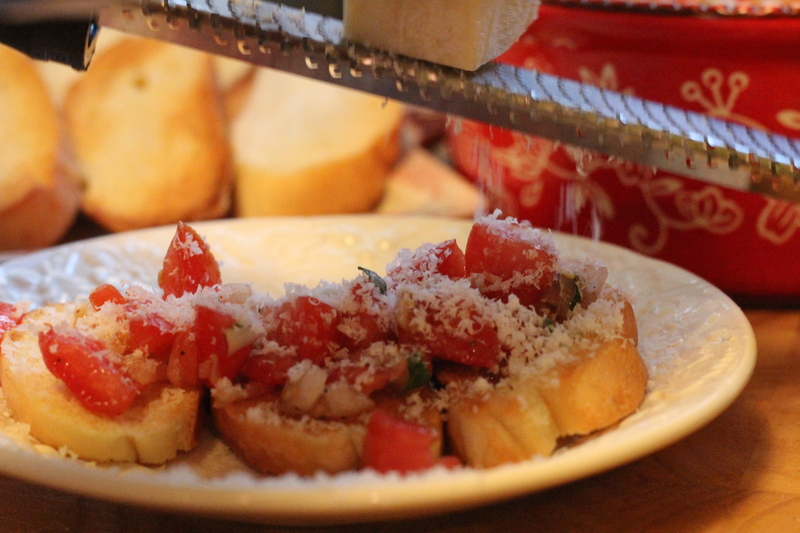 If you aren’t familiar with bruschetta, I would describe it as Italian salsa. It’s made usually of fresh tomatoes, onion, garlic, and basil and then a little olive oil and sometimes different vinegars are mixed in to make it a little saucier. 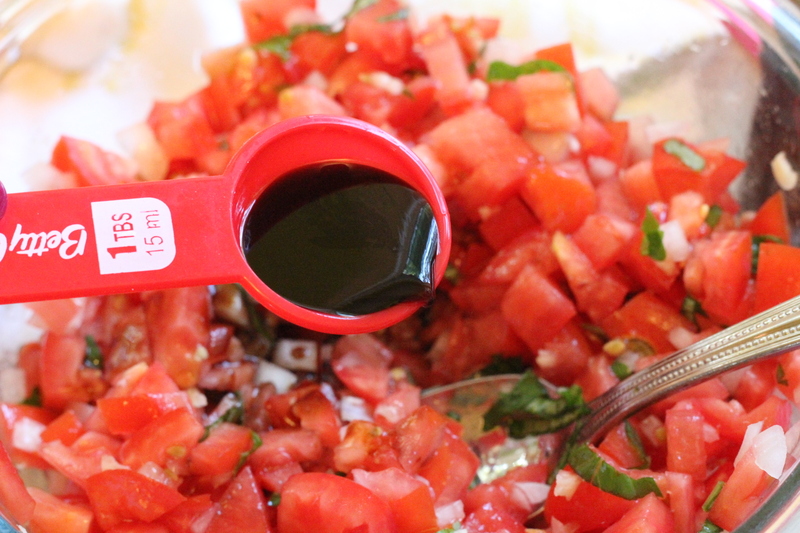 I use balsamic since I love that flavor. It’s normally served on toasted bread slices or you can even just use pita chips. Since you toast the bread, it’s great to use up some day old bread that’s a bit too hard for sandwiches. It’s great for a party since it can be made a day or so in advance and this allows the flavors to really come together. It keeps well so it’s easy to transport to parties or tailgaiting events. YUMMY! Hello – football season! 🙂 I usually serve the bruschetta cold on warm toasted bread, but you can also spoon the bruschetta on the toasted bread and then heat it all up in the oven if you like. Either way – it’s simple to make and packs a lot of flavor into every bite. 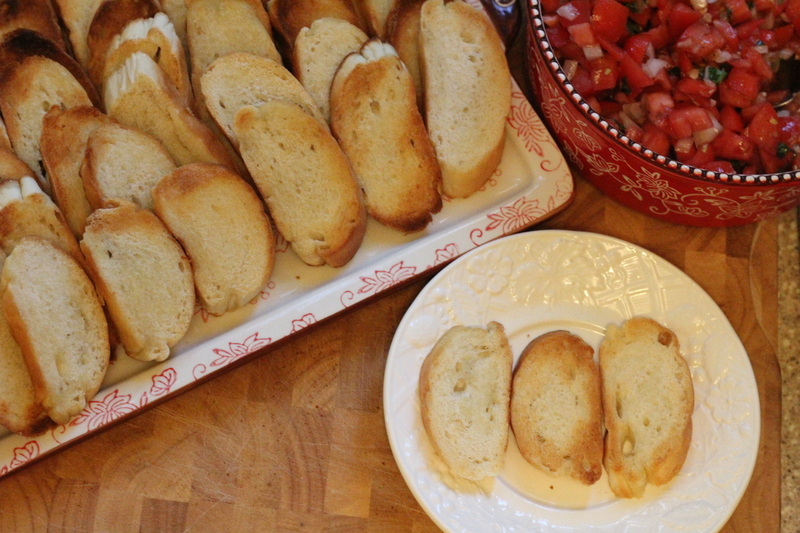 Yesterday, I used the leftover bruschetta in a quick and easy chicken dish that I’ll share with you soon. Stay tuned for that one.It’s so simple to throw together – you’ll be making this one all the time! Combine diced tomatoes, onions, garlic and fresh basil. It must be fresh basil – sorry dried basil just won’t do here. Flip and brush olive oil on the other side. Broil again until 2nd side is golden brown. Combine the diced tomatoes and onion, minced garlic and chopped fresh basil. Add in the olive oil and balsamic vinegar and salt and pepper and stir until combined. Set this aside. 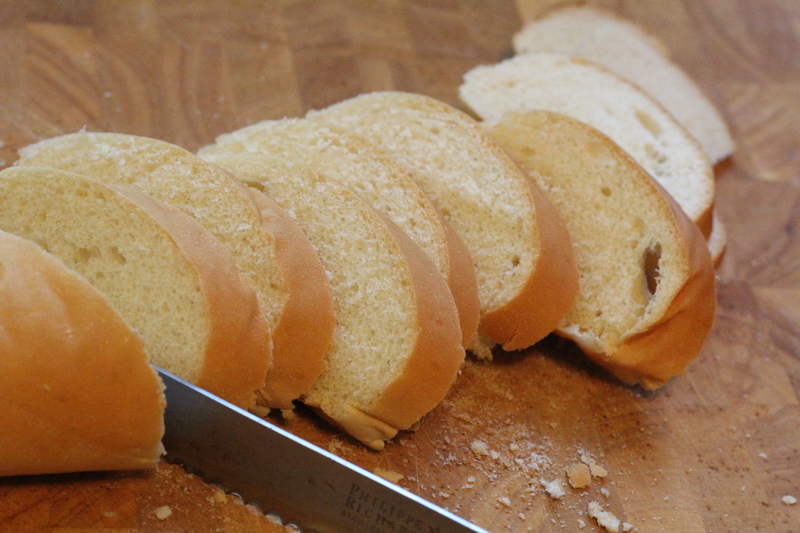 Slice your bread into 1/2 inch thick slices. I like to slice on the diagonal because it looks prettier. 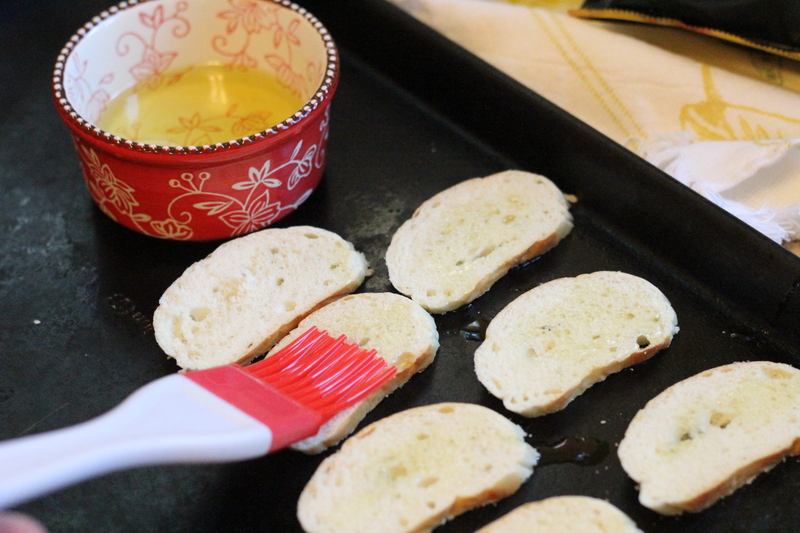 Lightly brush bread with olive oil. Broil on high just for about a minute or so until golden brown. Watch closely so you don’t burn it. 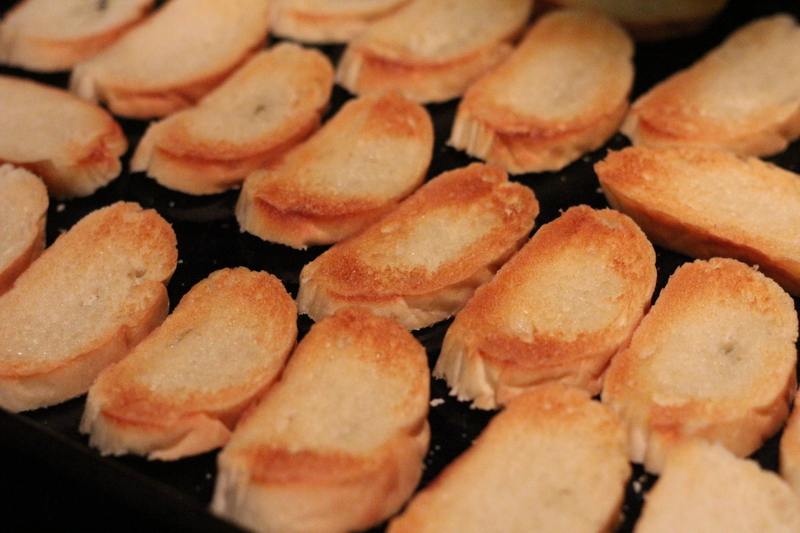 Flip each slice of bread over and lightly brush the other side with olive oil. Broil on high just for a minute or so until golden brown. Remove from oven and transfer to basket or platter. Top each slice with a spoonful of bruschetta mixture. Or let your guests spoon it on themselves. This is how I prefer to serve it, so the bread doesn’t get soggy. Top with grated cheese if you like. Serve immediately or you can keep warm in oven (not under broiler – just in a warm oven) until ready to serve. 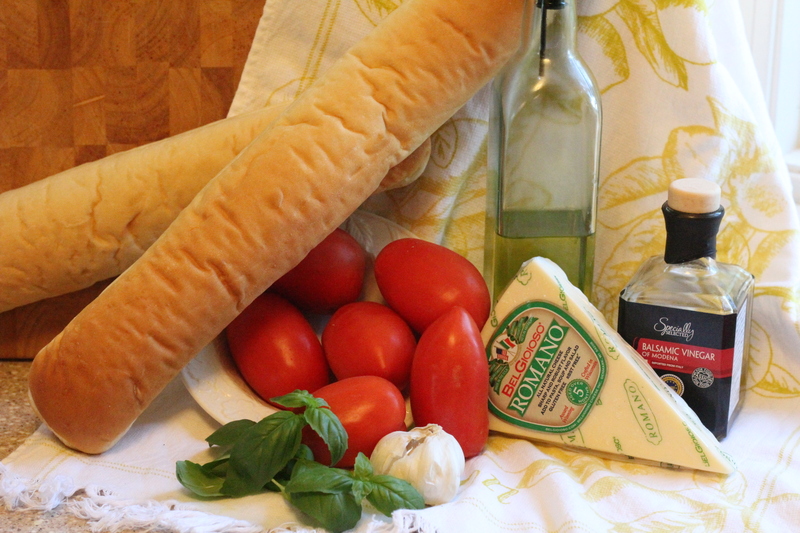 Refrigerate Bruschetta mixture up to a week.